Recently on a couple of occasions I have sat down in front my fabric stash armed with my favourite patterns and sewing books with patterns in them to get inspiration of what I can make from my current stash. My garment sewing stash isn’t overly huge these days but it also isn’t little. I am trying to be more selective to what I add to it these days, I’m not saying at times random pieces don’t get added to it but now days I try to think of a pattern in mind when I get new fabric. 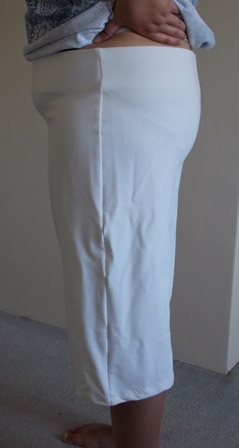 I purchased some white fabric years ago and I don’t know why as I don’t wear white fabric. It was a knit bamboo mix that had a fleece side to it. I’m thinking at the time maybe I could make a top from it but reality is it would’ve been too hot. Ticking off my patterns from A Beginner’s Guide To Sewing With Knitted Fabrics I thought why not make the Derwent Trousers out of them, the pattern called for fabric like it and the pattern kind of reminds me of yoga pants. I had a fall a few months ago where I tripped on the bottom of my pj pants and since then I have been living in leggings as I am scared I will have another fall so I thought these pants might be a nice alternative in the cooler months at home to leggings. It also gives me a chance to try out the pattern. I made the crop version as I just had enough fabric to make them. With the patterns in Beginner’s Guide To Sewing With Knitted fabrics I’m finding for tops I need the largest size possible but for pants or skirts I can go down to about the 3rd largest size. I don’t might a more snug fit on my waist and hips but not on shoulders and bust area. 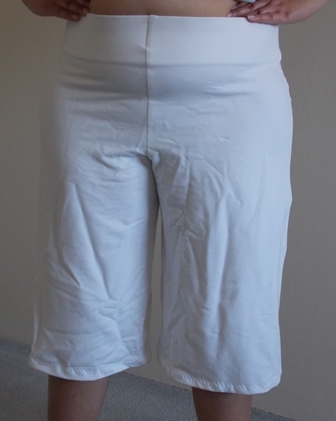 These pants are really quick and simple to make as there is only 2 pieces to them. I had a near disaster sewing up my side seams as I pinned them wrong and almost stitched instead of fronts to back leg to leg. Luckily I held them up pinned and thought this doesn’t look right! The only problem with these is when I picked them up I can’t tell which is the front and which is the back. I’m not entirely convinced in these photos I even have them on the right way. Along the centre seams on the elastic I tried to make one side longer than the other when I stitched them down but of course I can’t remember now if the shorter side means it is the back or the front. I guess if they feel uncomfortable I can always turn them around. I have never stitched with 3″ wide elastic and wasn’t even sure if I would like it around my waist. I was getting flash backs to those wide elastic belts that were in fashion in the late 80’s early 90’s which I hated. Surprisingly the waist is really comfortable. I attached the elastic to the top edge with my overlocker (serger) then just followed the instructions as per the book how to finish it. I’m really amazed at how flat it is sitting. To hem these I used a 3 step zig zag hem which is one of the hems recommended in the book. I was lazy and eye balled the hem as I pinned it. I’m not worried if they aren’t even, these are just for home besides due to my disability I don’t even stand even. The hem was really to do on my sewing machine which generally hates sewing knits. So would I make this pattern again? Absolutely, I think these would look great in black or denim. I only wear cottons so finding fabric for these is a little difficult for me. In thick cotton lycra they would make great casual yoga pants to wear out but I am looking to get more black unbrushed cotton (the store I brought it from doesn’t have it in stock at the moment) so that I can make a pair to wear to work. 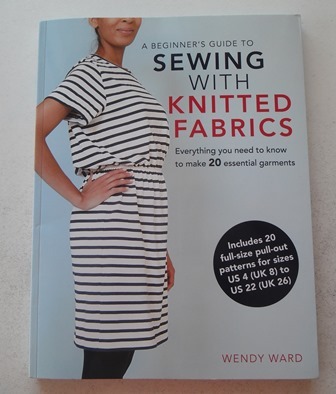 These are the 3rd item I’ve blogged about from my challenge of sewing my way through A Beginner’s Guide To Sewing With Knitted Fabrics. I have actually also made 2 other items from the book which I will blog about soon. They are. I have been wearing them a lot since I made them and actually got sad when they had to go in the wash!